There is one man included amongst the patriarchs in the Book of Genesis who only received recognition by name and lineage, who should (in my opinion) be given status as apPatriarch rather than, or as well as, “potentate,” (which puts him in a class below, I believe). His skills and prowess as a great hunter with a bow and arrow, was recognized, even by God. Nimrod the Hunter, was a leader amongst men and a builder of cities, including Babel and Nineveh. He was a great-grandson of Noah but did not live up to the virtues and standards that God had found in Noah. He was a bully amongst men, took what he wanted, including women, whatever he desired because he was a big man. His mighty bow and hunting were his major interests in life. He believed in God but was (I believe) somewhat jealous of God. Nimrod was the most powerful bowman in the land. He believed that if he shot an arrow into the clouds above, it would surely strike an angel, proof being, when the arrow returned to earth it would be stained with blood of an angel. In fact, his concept in the building of a Tower was that he could ultimately be able to reach Paradise. 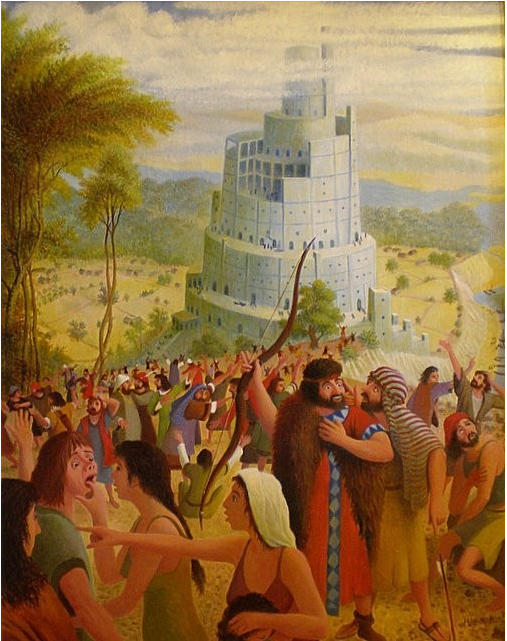 At some point during the building of the tower in Babel, it is written that God with an entourage, appeared on earth to see what was happening in Babel. What he found was all the people were speaking the same language and he decided that they should speak different languages. No one then would any longer understand one another, so he sent those with similar languages in different directions to establish clans and tribes throughout the land and where they settled they were to multiply and prosper. The workers on the tower also could not understand one another and dispersed with the others. That is how the Tower of Babel got its name.